Having a transit layover facility is important for our regional public transportation system to provide an off-street location to park buses for short periods of time and provide breaks for our transit operators, ensuring the health and safety of all commuters. On Friday, the San Diego Association of Governments board of directors will discuss options for a proposed transit layover and multi-use facility for our region’s public transportation network. This infrastructure is critical for the efficient operation of transit and to improve the downtown environment for all San Diegans. It is time the SANDAG board move forward with this project. Having a transit layover facility is important for our regional public transportation system to provide an off-street location to park buses for short periods of time and provide breaks for our transit operators, ensuring the health and safety of all commuters. Currently, buses have to park throughout downtown curbside spaces, impacting traffic congestion and blocking the view of pedestrians. 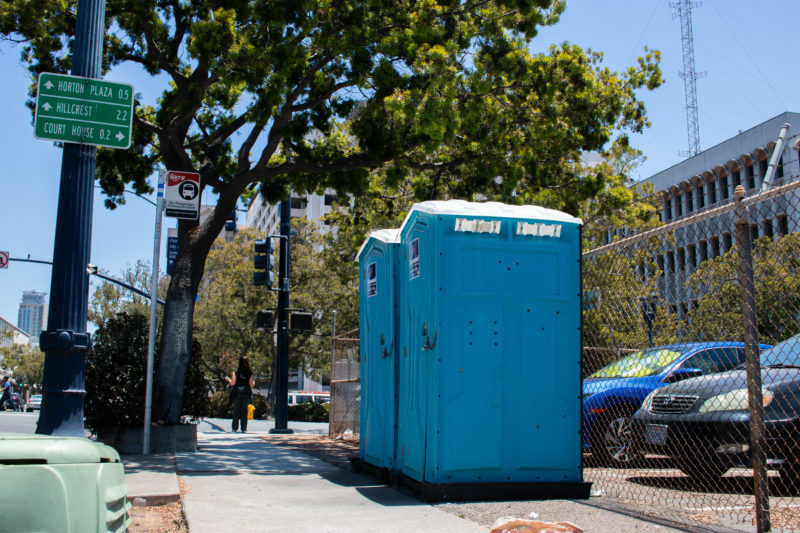 Porta-potties for drivers are also scattered throughout downtown sidewalks and are concerns for residents and businesses. Transit layover facilities currently exist throughout the San Diego region, and are common throughout large cities in the U.S., including tech hubs like Seattle and the San Francisco Bay Area. The proposed transit layover facility is a critical component for our Metropolitan Transit System bus rapid transit network in San Diego. The buses utilizing the transit layover facility are primarily serving Rapid bus routes. The two existing Rapids – one between Escondido and downtown, and the other between SDSU and downtown – carry an average of nearly 13,000 riders each day. About 7,100 get off and on downtown every week day. Another 5,000 per day are expected on the South Bay Rapid, which begins service between Otay Mesa and downtown in early 2019. In addition, the proposed facility design is envisioned to incorporate emerging technologies such as automated bus vehicles, connected vehicles, shared mobility services, vehicle electrification and microtransit. The proposed transit layover facility can be a win-win solution for our regional economy, environment and mobility by enabling thousands of people to arrive downtown every day without driving and parking. The proposed site has been reviewed and vetted, including on June 24, 2016, when the SANDAG board unanimously approved the current proposed location on the blocks bounded by A Street, Union Street, B Street and State Street as the preferred site. This project is an opportunity to demonstrate leadership in improving our regional transit system. As chair of the Metropolitan Transit System, I strongly urge the board to move this project forward. Georgette Gómez is a member of the San Diego City Council, and chair of the MTS board of directors. Georgette Gómez is a San Diego city councilwoman, representing District 9, and the chair of the Metropolitan Transit System.